AirportLostandFound.com announced today a global, cloud-based SAS system that is tailored specifically to the needs of airports and airlines. I saw these flaws in the system and developed a solution that can globally connect airlines, airports and air travelers. AirportLostandFoundSoftward.com will be a huge asset to Lost and Found departments across the globe as it will reduce long lines and waiting periods, which will improve customer satisfaction and reduce costs. Not only can the cloud-based software be seamlessly updated to the latest technology, it also integrates directly with the consumer site, AirportLostandFound.com, where air travelers can fill in an online form to report a lost item from anywhere in the world. Both websites take privacy and security seriously; all users go through a sturdy and secure ID verification process. 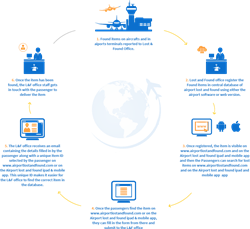 AirportLostandFound.com is a technology-based, item recovery service with a global network. AirportLostandFound.com's service is built around convenience and efficiency. Since 2004 the company has been working to streamline and automate the entire lost-and-found process for airports and air travelers. AirportLostandFoundSoftware.com wants to synchronize all the world's public transit lost and found departments to a single, universal system one lost item at a time.